Beirut (Agenzia Fides) - The internal crisis within the Syriac Orthodox Church, after charges of "betrayal of faith" on behalf of six metropolitans against Patriarch Mor Ignatius Aphrem II, could be addressed during an extraordinary session of the Holy Synod. This is what emerged during a consultory meeting, convened by Patriarch Mor Aphrem at the patriarchal residence of Atchaneh, in Lebanon, in which 18 Metropolitans and Syrian Orthodox Patriarchal Vicars took part. 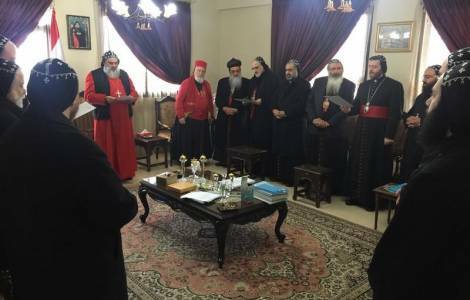 This is what a statement issued on Thursday, February 16 by the general secretariat of the Syriac Orthodox Synod reports, noting that the Metropolitans and the patriarchal Vicars emphasized that the excuse letter issued by the six Archbishops did not reflect the gravity of the mistakes committed. The special session of the Holy Synod – says the statement - could be convened in the period of the Great Lent to study and discuss the aforementioned issues from all aspects, in order to "make the right decisions and take the suitable measures according to the Constitution of the Church". The six metropolitans, in conflict with the Patriarch, on February 8 had released a statement in which they claimed that the Primate of the Syriac Orthodox Church no longer deserved the title of "defensor fidei", since in their opinion he had sown doubts and suspicions in the hearts of believers, with statements and actions «contrary to the teachings of Jesus Christ, according to his Holy Gospel».